Random Encounters Remastered is intended to provide GMs a detailed, comprehensive source for randomly generating unique encounters with a variety of interesting terrain features, NPCs and site-specific monsters. 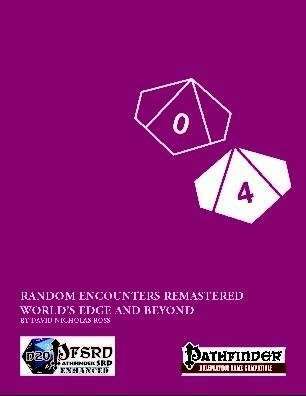 More than simply a bunch of tables, Random Encounters Remastered also presents rules, guidelines and advice for quickly creating interesting roleplaying and combat situations. Each volume of Random Encounters Remastered describes a number of adventure areas. These encompass common sites such as grand marketplaces, eerie woods, and windswept plains to more unusual locales such as planar strongholds, underworld battlefields and endless caverns. The areas can be further customized by adding new terrain features and hazards described in each book. The random monster generator for each setting is setup to automatically provide a CR-appropriate challenge for a party no matter their level so a GM doesn’t have to worry about encounters that are too easy or too hard. Wherever a party finds itself, the tables and rules in this book can help a GM construct a quick, memorable encounter. Adventure areas included: Abyssal Rifts, Beshadowed Backwoods, Elemental Oasis, Historic Battlefields, Misty Morass, and Summer Otherworld. This product makes use of opponents from Bestiary 1, 2, 3, the Gamemastery Guide, and the NPC Codex.